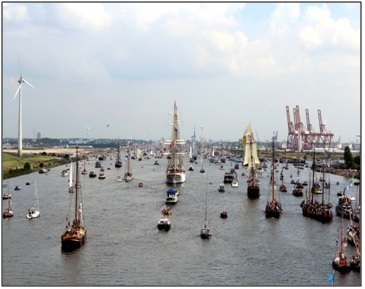 The ship cast off from Bremerhaven on 16 Aug 15 and commenced its passage towards Amsterdam. 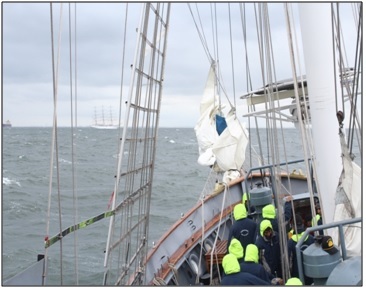 On 17 Aug 15 ship received a gale warning from the sail organisers. 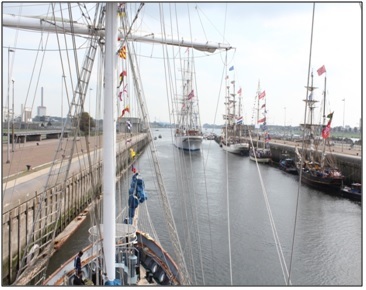 All Tall ships were instructed to enter Ijmuiden Harbour on 18 Aug 15. Ijmuiden is a fishing Harbour 12NM short of Amsterdam. 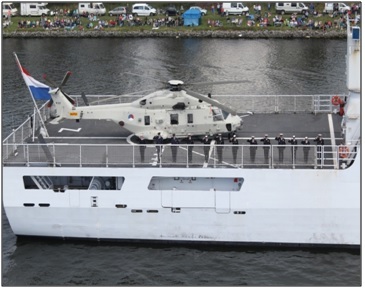 Ship was able to reach off Ijmuiden on 18 Aug 15. 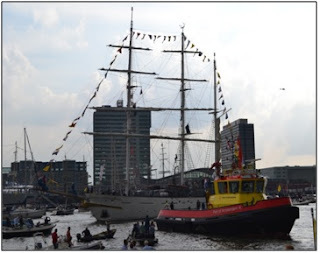 Finally the ship entered Ijmuiden harbour on 18 Aug 15. The time alongside was used by the ship to prepare the ship side and the ship for the sail parade on the following day. Sea Trainees rehearsed manning the yards while alongside Ijmuiden. The sea trainees made a safety net for the lost door and presented it to MCHSSI. 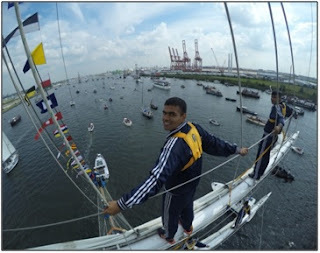 Upon exiting the locks the ship participated in the sail parade. During the sail parade the ship was dressed over all and sea trainees were manning the yards. 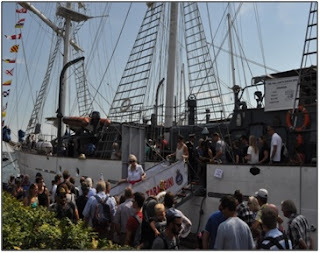 With thousands of boats and crafts participating in the event this was the biggest event the ship has participated in. 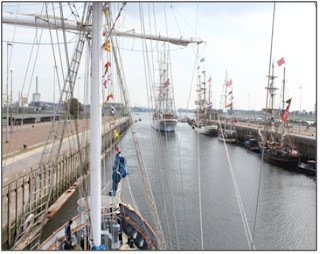 The 12 mile sail parade was navigational challenge hardly any waters for the ship to manoeuvre. 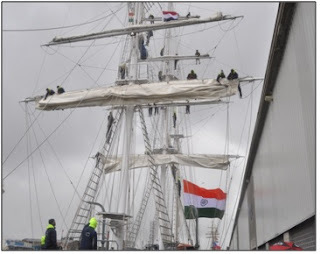 We still put up quite a show, with the yards and the ship’s sides manned, ship dressed overall, tall ship triclolour hoisted, martial music playing on the broadcast and the crew greeting the crowd with “Teen Jais”. 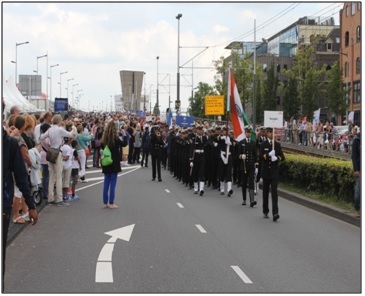 During the sail parade the ship exchanged salute with the Netherland Naval Ship Zeeland as they passed each other. Thousands of small boats and crafts formed this 12 mile long convoy during the Sail Amsterdam. The city was packed with an estimated 4 million visitors from all over the world. On completion of sail parade the ship commenced its approach towards the jetty. Lots of small boats and ferry were present in the channel and approach to the jetty was full of traffic. Finally a port control vessel cleared the traffic and the ship was secured alongside port side to in Amsterdam. An Indian Ship so far away from home was quite a tourist attraction for the locals. The jetty was full of eager enthusiasts within minutes of the ship’s coming alongside. Peoplefrom all over Europe and lot of Indians visited the ship on the first day itself. 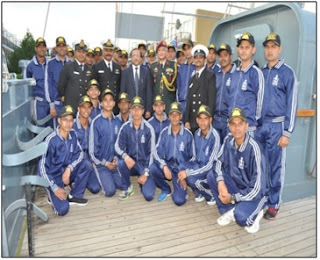 During the stay at Amsterdam, his Excellency MR J S Mukul Ambassador of India visited the ship and had an interaction with the sea trainees. Sea trainees shared their memorable experience about the voyage and their expectation from Amsterdam during their stay. Sea trainees and the ship’s crew actively took part in various games like football, volleyball, chess, table tennis, darts and golf conducted by the organisers of Sail Amsterdam Ltcdr Tanmoy Mukherjee, the Executive Officer of the ship was awarded the first prize in the golf tournament. 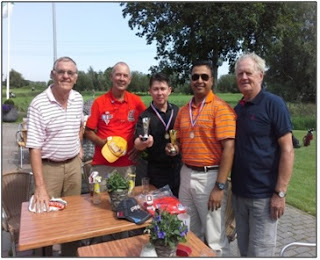 SWA 3 Avinash participated in Chess competition and won third prize. 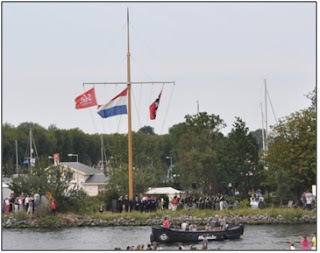 A Crew Parade of all the participating ships was held from Town Square at Amsterdam. The ship paraded two contingents. 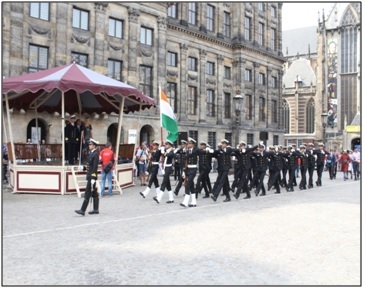 A marching contingent of Officers and sea trainees and a contingent of ship’s company dressed in traditional wear representing different states of India. 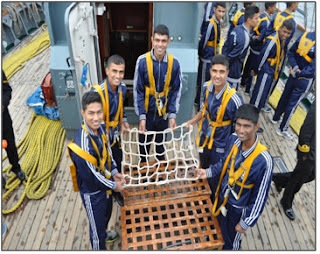 The crew of the ship had created a two minute continuity drill for the marching contingent. 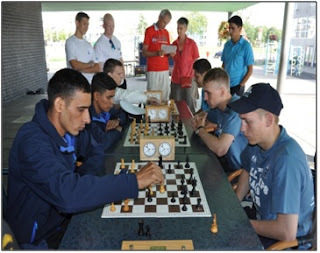 This drill was practiced at sea on passage to Amsterdam and then finally fine tuned on the jetty at Amsterdam. The ship’s marching contingent which was lead by the “Nishaan Toli” in full ceremonials, with the Bugler playing and the Sea Trainees singing along was a big hit with the spectators. Even the crew from other ships stopped during the parade to watch the drill. 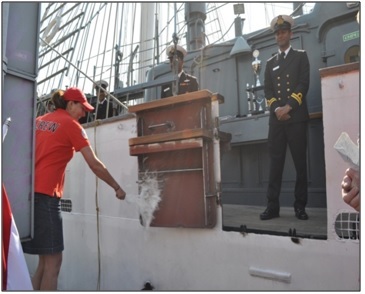 The ship’s port side bulwark door which was broken by the pilot boat due to bad weather during entering harbor, was fabricated by M/s Damen Shipyard Ltd and was installed onboard in a small ceremony attended by the Sail event organisers and the shipyard representatives. The ceremony turned out to be a grand one attracting lot of attention from the crowd gathered. After a fabulous stay at Amsterdam the ship cast off on 23 Aug 15 and participated in the Sail Thank You Parade. Thousands of small boats bid adieu to all the Tall Ships took part in the Sail Amsterdam festival.